In addition to a major update to our Bot Platform, we’re making several design and interface improvements to our apps today. This post mostly shows iOS screenshots, but be sure to check out the massive Android redesign we did in this version. Starting today, our iOS users can easily share photos and videos to other Telegram chats with a comment, or send them to other apps. We’ve also added a new slick in-app media player so that you can watch videos from YouTube and other services in style. It will also take you fewer taps to start watching. Adding new sticker packs has become easier. Tapping on any sticker in a chat will now instantly open the relevant sticker pack. You can preview and send stickers right from this menu. Now you won’t have to teach your grandparents how to add stickers. On iOS, ‘Tap and hold to preview’ also works with GIFs in the GIF panel. Pull up for additional actions. The same is true for content from inline bots. Tap and hold to preview results suggested by inline bots before sending. Try it now with @gif, @sticker or @coub. The Android app received a major tuneup in the design department. We’ve redesigned the chat screen, optimized the colors, reimagined buttons and message bubbles, created beautiful progress bars, fully revamped documents and other attachments. We’ve also improved the design of our iOS app, adding juicy progress bars and a new look for documents. 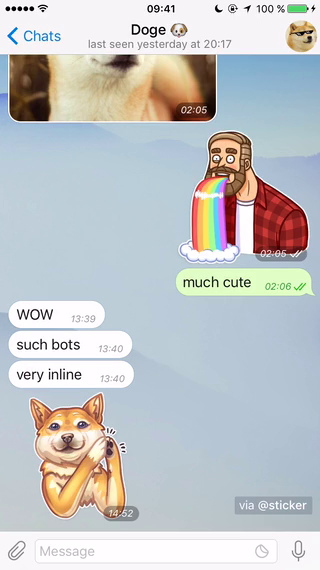 Telegram Desktop has also received multiple design improvements and now fully supports the new bots.